In 1987 and 1988, many events were being held across North America, but there were few major tournaments which really excited people. By this time the Petaluma World Wristwrestling Championships had been off the national airwaves for a few years and the prize money had dropped considerably due to lower attendance levels. The excitement caused by the Over the Top series of events had dissipated. WPAA events were not offering as much prize money as they did during the organization’s heyday. The sport was in need of something new. This came in late 1988 in the form of a series of professional events sponsored by a new brand of Canadian whiskey liqueur called Yukon Jack. Heublein, a producer and distributor of alcoholic beverages, wanted to introduce Yukon Jack to the American market. The company had had past success introducing new products by tying them to sporting events, and so they hired Alan Taylor Communications (ATC), a firm specializing in sports-based promotions, to select a suitable sport. Armwrestling was chosen. Sue Ritter, Heublein’s director of marketing for Canadian products said that Yukon Jack had a “rugged male outdoor feel” to it. The type of consumers attracted to it were usually ages 21 to 30 who tended to participate in a lot of outdoor physical activities. Arm wrestling just seemed like a good fit. 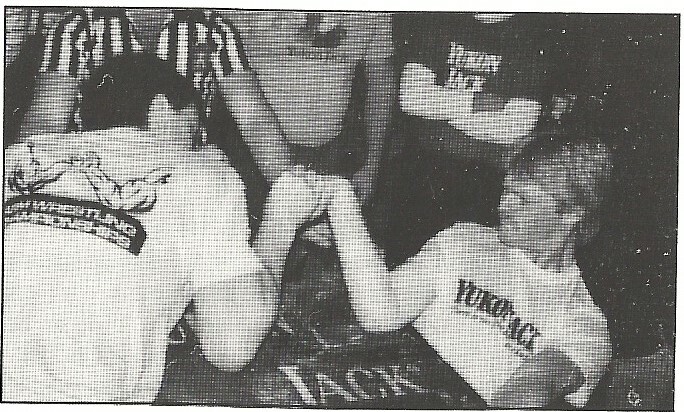 In the summer of 1988, Wayne Catan from ATC got in touch with Ray Darling, who was an American Armwrestling Association Director and active promoter in the northeast US at the time, and asked if he would be interested in running a few armwrestling tournaments sponsored by Yukon Jack. Ray jumped at the chance. Corporate sponsorship was difficult to come by, and from their initial conversation, Ray immediately recognized the potential. These tournaments would promote both the sport and Yukon Jack, plus money would be raised for a well respected charity: The Multiple Sclerosis Society. Two test markets were initially selected to determine the sport’s suitability as a promotional tool. The first test market was Albany, NY. Two events were held on back-to-back Friday nights in separate venues in December 1988 – “September's” on December 2nd and “Madden's” on December 9th. These events were promoted through a local media blitz, with official press releases and several newspaper articles. The entry fee was very reasonable. For just $7, competitors received a Yukon Jack t-shirt, plus a chance to try to win some money. Yukon Jack matched to the amount of money collected through entry fees and t-shirt sales, and donated the entire sum to the local chapter of the Mutliple Scleroris Society. Yukon Jack signage was prominent at the events, and there were Yukon Jack drink specials on offer. To drum up even greater publicity, special guests were invited to the tournaments. At the December 2nd event, these guests included 1984 Olympic Greco-Roman wrestling gold medalist Jeff Blatnick and 1988 Olympian Jason Morris, a member of the American judo team. The double elimination tournaments featured three men’s right handed weight classes (0-160 lbs, 161-190 lbs, 191+ lbs) and one women’s open right handed class. Turnout was great for these events, with 88 entrants in the December 2nd event and 67 entrants in the December 9th event. The first place winners from each event met for the finals on December 21st at the Holiday Turf Inn. The first place finishers of this initial championship were Socrates Fronhoffer (light), Tom Bonnier (middle), Fred Decker (heavy), and Terri Plunkett (women). A total of $2,300 was raised for the Multiple Sclerosis Society. The Albany events were judged to be a success. However before conducting tournaments in the second test market (Worcester, MA) in early 1989, Ray suggested a few changes to Heublein and ATC. The biggest change was getting rid of the “Yukon Jack Man”, a person dressed up as the character long-associated with the Yukon Jack brand. Ray felt the live character’s presence took away from the professionalism of the event. Heublein agreed to eliminate the live character, but incorporate the image into signage in a more appropriate manner. The Worcester tournaments were received in much the same way as the Albany events. Turnout was high and there was considerable media attention. The winners of the Worcester finals were Norm Devio (light), Larry Fontaine (middle), Roy Gabrielle (heavy), and Grace-Ann Swift (women). Based on the success of the test market events, it was decided that the pairing of Yukon Jack and armwrestling was a good one, and plans were made to hold a series of regional tournaments all over the country that would culminate in a national final championship. Satisfied with Ray’s professionalism and expertise, ATC enlisted his help to run the event series. Regional tournaments were scheduled in nine different cities between October 1989 and April 1990 – Boston, Washington D.C., Denver, Los Angeles, St-Louis, Springfield (MA), Baltimore, Portland, and Chicago. A national championship would be held in Chicago, just a few days after the regional qualifier in that city. Each regional event consisted of two double elimination tournaments followed by a final, or regional, championship that paired the winners from each of the two tournaments. These tournaments typically took place over three consecutive evenings, in different venues. The same entry fee and weight classes were used, and the first place competitors from each of the nine regional championships qualified for the national finals. $200 first place cash prizes were up for grabs at the regional finals, while the national championships offered cash prizes for the top three finishers in every class ($1,500 for first, $750 for second, and $250 for third). 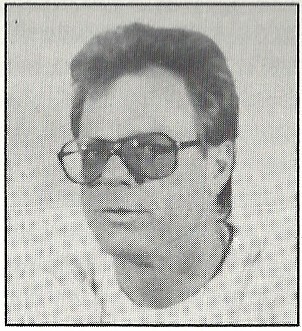 Ray directed the tournaments in all nine cities during the 1989-1990 series. In each city, Ray did television, radio, and/or newspaper interviews. He even promoted an event on Good Morning America at one point. To better promote the events, he invited a top armwrestler from the area to take part in the interviews and provide demonstrations. Some of these armwrestlers included John Brzenk, Dot Jones, Gabe Accardi, Clay Rosencrans, Dave Patton, Virgil Arciero, and Grace-Ann Swift. The 1990 finals were called the Yukon Jack National Arm Wrestling Championships, and took place on April 27th at Champions Sports Bar in the O’Hare Marriott hotel in Chicago. 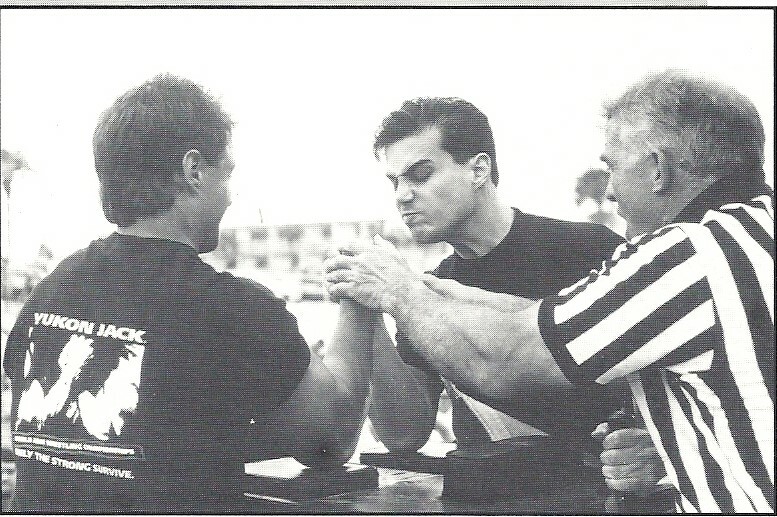 The caliber of competition was very high, and featured some classic matches between John Brzenk and Richard Lupkes – the two armwrestlers generally recognized as the best pullers on the planet at that point in time. In the end, the champions of the men's divisions included Dave Patton, Jerry Nelson, and John Brzenk. Grace-Ann Swift won the women’s division. Heublein was very pleased with the 1989-1990 series of events, and decided to renew the series for 1990-1991. For this season the series was expanded from 9 to 13 cities. The cities that made up the schedule included Portland, Washington DC, St. Louis, East Rutherford, San Diego, Stamford, Springfield (MA), Los Angeles, Minneapolis, Chicago, Detroit, Denver, and Tampa. During the 1990-1991 series, Ray’s involvement in the events began to diminish. However, he, Lori Cole (an active California armwrestler), and a few others helped ATC make connections with tournament directors throughout the country. In each city, two or three representatives from ATC teamed up with these directors to put on consistent, high-quality events. John Brzenk and Dave Patton soon became official spokesmen for the series (John on the west coast and Dave on the east coast) and they would regularly speak to the media. The tournament format and prizes remained basically unchanged from the previous season. The 1991 national finals took place at Champions Sports Bar in the Westshore Marriott hotel in Tampa. John Brzenk and Dave Patton successfully defended their titles, while veteran Johnny Walker took the middleweight class and 6’3” Dot Jones won the women’s class. The 1991-1992 series of events was almost identical to the 1990-1991 series, aside from a slightly different mix of cities. Westport, Milford, Buffalo, and East Rutherford were among the new cities in the 13-stop circuit. Attendance at events continued to be strong. In its brief existence, the Yukon Jack Arm Wrestling Championships had already established itself as the leading series of professional armwrestling tournaments. Qualifying for the national championship was a significant achievement was a target for most serious competitors. The 1992 national finals once again took place at the Westshore Marriott hotel in Tampa, but this time the tournament was held in the main ballroom. John Brzenk, Dave Patton, and Dot Jones each earned yet another Yukon Jack national title, and Andrew “Cobra” Rhodes won his first. 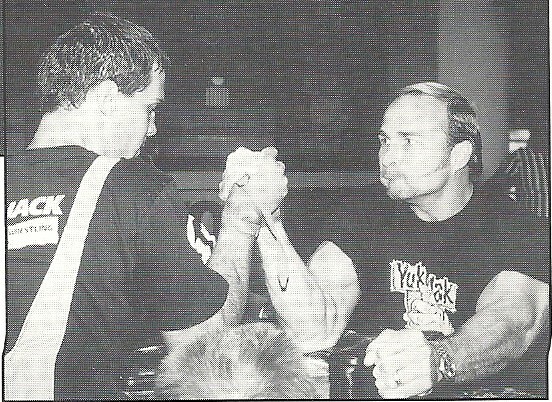 Heublein and ATC decided that with the proven success of their series of armwrestling events, there wasn’t a need to change much for the 1992-1993 season, so once again a 13-city tour was scheduled. Events were held in Milwaukee, Portland, Hartford, Denver, Seattle, East Rutherford, Chicago, Albuquerque, Syracuse/Buffalo/Rochester (Western NY Trio), Tampa, Los Angeles, Detroit, and San Francisco. The national finals moved to an outdoor venue for the first time in 1993. With this move came a significant increase in the number of spectators, and an even greater opportunity to promote Yukon Jack and armwrestling. The action went down at San Francisco’s Pier 39, and received substantial media attention. John Brzenk and Dot Jones successfully defended their titles once again, while Johnny Walker won his second title. Allen Fisher managed to unseat Dave Patton to sit atop the lightweight class. During the first four years of Yukon Jack national circuit events, regional tournaments averaged 60 to 100 entries, as well as 40 to 100 spectators. Though difficult to attribute exact causes of sales growth, Sue Ritter (Marketing Director for Heublein), confirmed that during these four years, Yukon Jack’s sales had increased at a rate of approximately 3 percent a year, a figure that pleased the company. 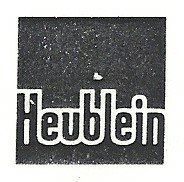 This continuous sales increase motivated Heublein to expand the series to an astounding 26 cities for the 1993-1994 tour. The total purse was also increased for the season-end championships from $10,000 to $15,000, with $2,500 given out to the first place winners. 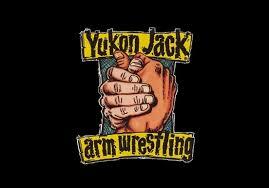 The finals were also renamed the Yukon Jack World Arm Wrestling Championships. Incredibly, the entry fees during this season were actually lower than ever – $5 – which still entitled competitors to a Yukon Jack t-shirt. Several new cities were visited during the 1993-1994 series. Among others were Baltimore, St. Paul, and Sacramento. Because of the larger number of regional events, more competitors qualified for the year-end championships than ever before. 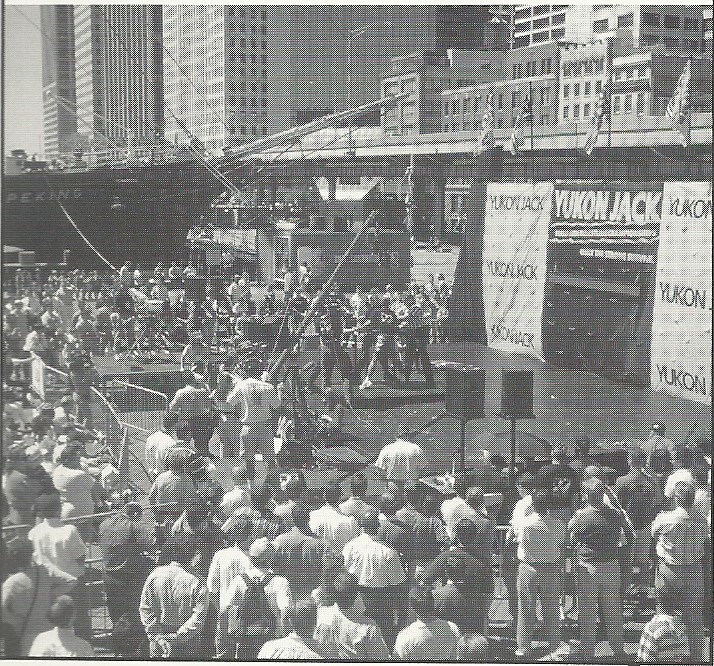 The 1994 Yukon Jack World Champioships were once again held in San Francisco, but this time in Justin Herman Plaza. The tournament was filmed and aired nationally on The Nashville Network (TNN). Dave Patton, Johnny Walker, and Dot Jones all added to their long list of titles, and Cleve Dean added his first Yukon Jack world title to his incredible résumé, with a very memorable match over Gary Goodridge. 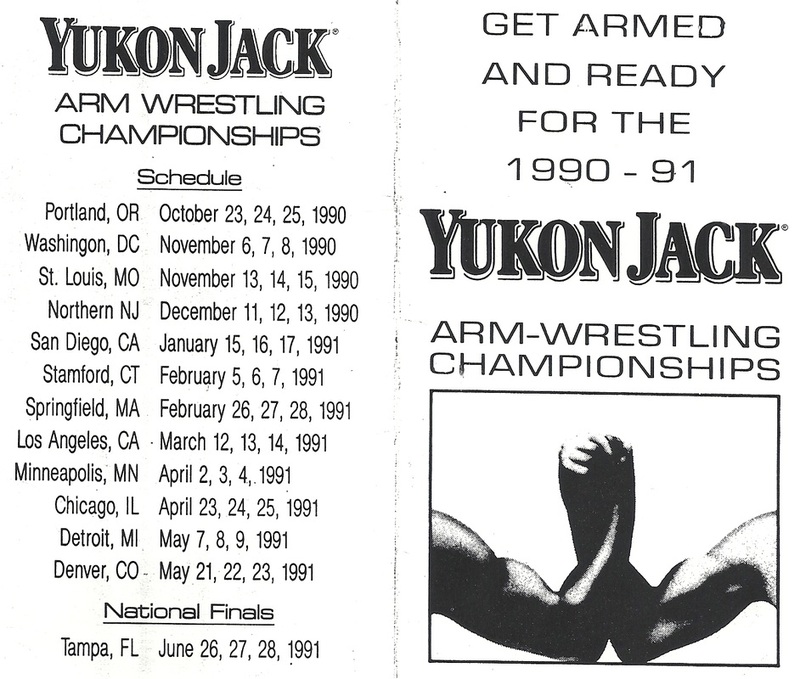 If not already accomplished, by the mid-1990s the Yukon Jack year end championship had established itself as the toughest armwrestling tournament to win in the world – more difficult to win than the AAA Nationals, the Petaluma World Wristwrestling Championships, and even the WAF World Champioships. The Yukon Jack series underwent significant changes for 1995. The weight classes were changed slightly to 0-165 lbs, 166-198 lbs, and 199+ lbs, to align with international standards. The number of tournaments was also significantly reduced, down to four regional qualifiers and one year end international championship. The regional qualifiers would now be one-day affairs, and held on Saturdays. (Previously qualifiers were generally held over three evenings, and in the middle of the week.) All events would be held in outdoor venues, vastly increasing the number of people who would be able to see the tournaments. 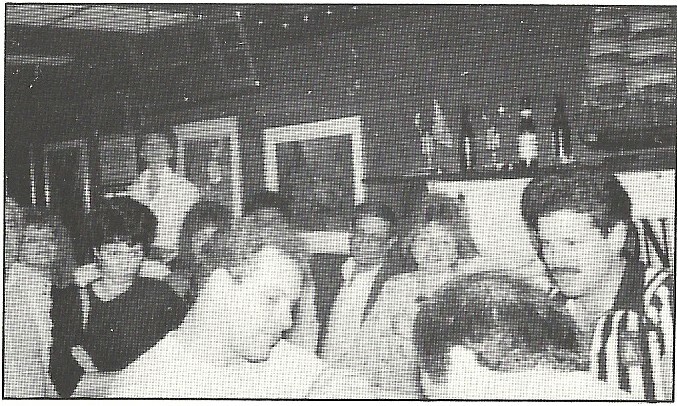 Prior to 1995, virtually all regional events were held in bars, resulting in them being hidden from the general public. Because there would now be fewer qualification opportunities, the top three finishers in each class would be able to attend the finals, rather than just the first place winner. Year-end champions from the previous year also automatically qualified for the finals. Finally, the cash prizes at all events shot up significantly. Regional events would now offer cash prizes to the top six in each class, rather than just to the first and second place finishers: $750 for 1st, $200 for 2nd, $150 for 3rd, $100 for 4th, $50 for 5th, and $50 for 6th. The cash prizes for the year end event would be $3,500 for 1st, $2,000 for 2nd, and $750 for 3rd. The 1995 regional events were held in Daytona Beach, Los Angeles (Venice Beach), Boston, and Chicago. Because of the limited qualification opportunities, attendance at these tournaments was considerably higher than attendance at regional events in previous years. More and more international competitors started attending as they too wanted to take part in the Yukon Jack International Arm Wrestling Championships. The Daytona Beach event had 137 entries, averaging close to 40 competitors in the men’s classes. 3,000 spectators witnessed the tournament. John Brzenk won the middleweight class and Dot Jones won the women’s class. After three consecutive year’s of placing in the top three, Gary Goodridge finally won his first Yukon Jack World title, and at the same time became the first non-American competitor to win one. 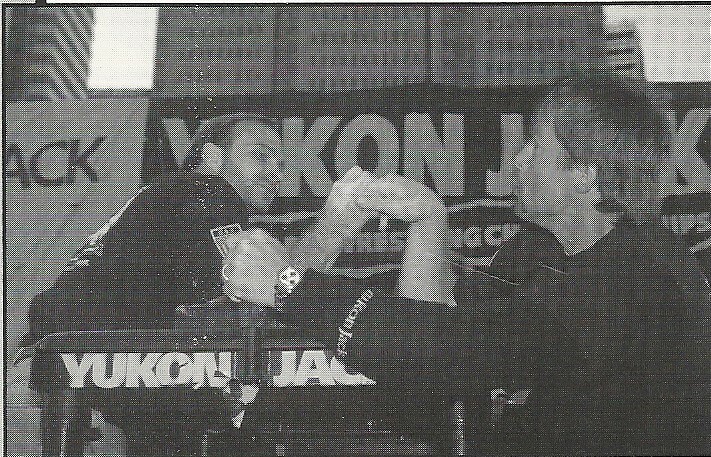 The 1995 International Championships aired several times on ESPN during the fall, to the delight of armwrestling fans. The 1996 series of events was run very similarly to the 1995 series, however different cities hosted the events. Regional qualifiers were held in Sacramento, Indianapolis, Cleveland, and Denver, with the International Championships held at Walt Disney World. As had become the norm, turnout was high at all 1996 Yukon Jack tournaments. The International Championships at Walt Disney World featured a separate celebrity charity event. 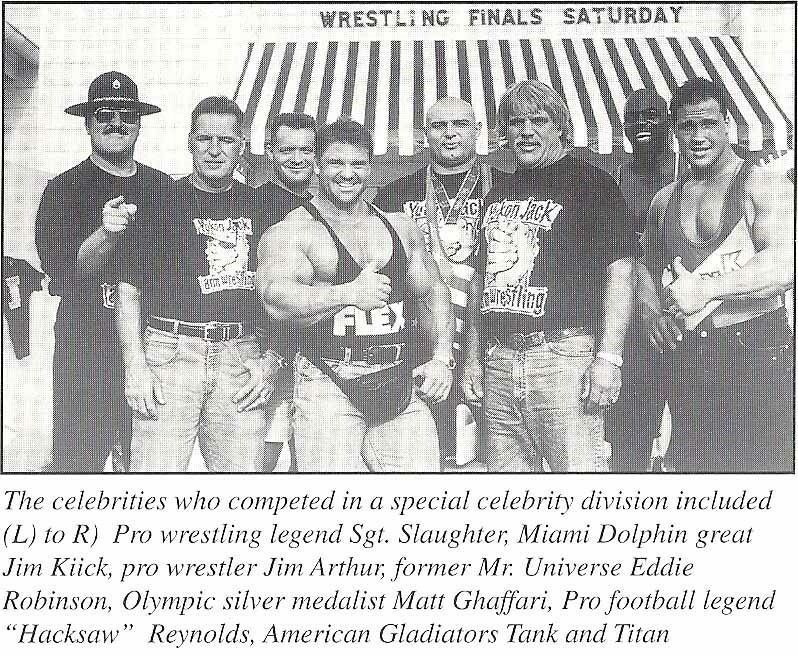 Pro wrestlers Sergeant Slaughter and Jim Arthur, pro football players Jim Kiick and "Hacksaw" Reynolds, Olympic silver medalist wrestler Matt Ghaffari, Mr. Universe Eddie Robinson, and American Gladiators Tank and Titan took part in this mini-tournament. In the end, Titan won the division. The pro tournament saw Gary Goodridge, John Brzenk, and Dot Jones add to their Yukon Jack world titles, as well as Swede Andreas Rundstrom earn his first – in the process becoming the first and only non-North American puller to win a Yukon Jack World title. By the end of 1996, because of diminishing returns, Heublein decided to stop sponsoring professional armwrestling tournaments. The company did not sever ties with the sport completely, but rather decided to run a series of amateur (non-cash) events in 1997 instead in order to cut costs. A handful of regional qualifiers were held that year in different cities such as Duluth, Grand Rapids, and Madison, with the finals taking place in Dearborn Heights (Detroit). The entry fee was $5, and the top two finishers in each class qualified to attend the year end championships billed as the Battle of the Biceps. The weight classes were slightly altered: 0-150 lbs, 151-170 lbs, 171-190 lbs, 191 to 210(?) lbs, and 211+(?) lbs. The final event of this amateur series took place on September 6th, 1997. The head referee was Steve Stanaway (who was a referee in all of the Yukon Jack National/World Championships), and Mills Lane was a special guest referee (the TV judge and boxing referee who officiated the famous Tyson-Holyfield fight where Mike Tyson took a bite out of Evander Holyfield's ear). Mr. Lane had never officiated an amrwrestling event, but Steve game him a 30 minute clinic prior to the tournament. Steve felt Mills actually did quite well considering his inexperience. 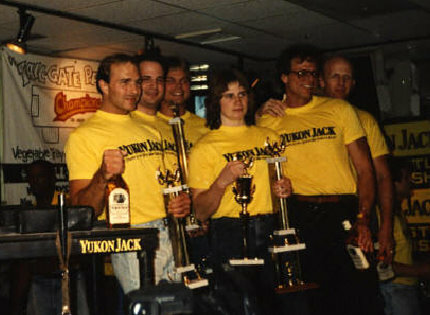 The 1997 National Championship was the final event sponsored by Yukon Jack. Turnout and media attention for the 1997 events was down considerably from the previous years. However, the final championships were filmed and did in fact air on ESPN. By the end of 1997, Heublein felt it had achieved what it wanted from its ties with the sport, and Yukon Jack's relationship with armwrestling regrettably came to an end. Between 1988 and 1997, Yukon Jack tournaments were held in over 50 different cities, and over $100,000 was raised and donated to the Multiple Sclerosis Society. 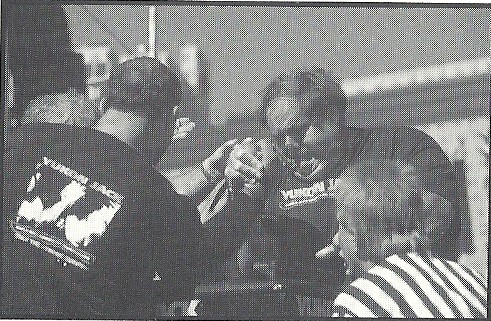 Virtually all of top armwrestlers of the era competed in the Yukon Jack events. The Finals were the biggest professional tournament in the sport. It you won this event, you were recognized as the best. A number of professional tournament series have emerged over the past 15 years, but the Yukon Jack series is still seen as the most successful pairing of sustained corporate sponsorship with armwrestling to date. Lori Cole: "I took 1st at several qualifiers during the years they did it. I only attended one Finals which was the 1st year in Chicago, Illinois. They only had one women's open class that year. I don't remember what place??? No money, I remember that:) Actually, I did attend one more finals in San Francisco, CA, but I was retired or injured then and did not compete. I can't remember exactly. That was the tourney where Gary Goodridge beat Cleve Dean. I don't think he beat him more than once but it was amazing to see. The Yukon Jack tournaments started off very small and in bars. They gained momentum over the next couple of years because nothing else was really going on in the sport with any money. 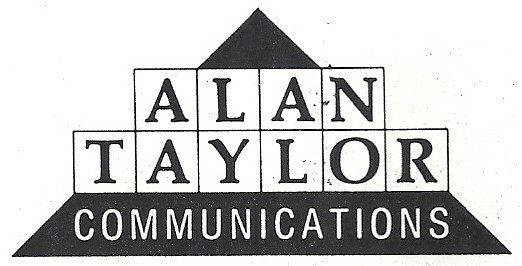 Alan Taylor Communications was the Ad Agency for Heublein "Yukon Jack." They contacted me to get info on how to go about promoting the sport. I helped them to make contacts with all the promoters in the various states. They pretty much used those promoter contacts to throw the tournaments with no compensation. I became friends with the Brand Manager "Barry Marek" for Yukon Jack and we are still friends to this day. He gave me money to put on a tourney as part of Octoberfest at Arnold Schwarzenegger's Church. We Called it "Yukon Jack". This particular tournament had nothing to do with the series of tournaments put on by Alan Taylor Communications for Heublein's "Yukon Jack". When I first got involved I did not see eye to eye with "ATC" by putting on the tournaments in bars. I did not want that connection to the sport. I did not feel it was dignified enough and belittled our sport. They continued on and eventually stopped putting on the events in bars because the events got so big the bars could not accommodate all the Armwrestlers:) That made me feel vindicated in my vision for our sport. Our sport is not a bar room sport it deserves arenas like any other sport." Allen Fisher: “The tournaments were very well run. Very professional and well attended. The Yukon jack people had done their homework. They helped put armwrestling on the map! Allen Beal did a great job of advertising the events throughout United States. They had qualifying events. 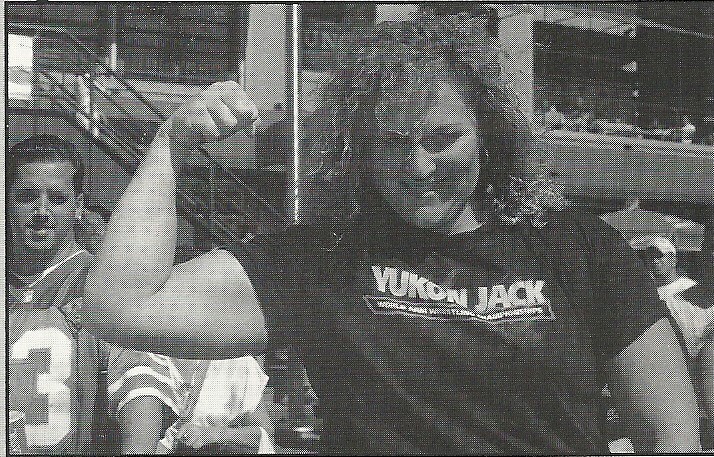 The Yukon jack in 1993 in San Francisco Pier 39. These were the best! They had captive audiences and the places were strategically chosen. Their prizes were great. Cool jackets, bags and embroidered arms on the stuff! At Boston Market, I remember the most because I had not been arm wrestling from 1987-1993. Because of family, self employment. I didn’t know what to expect. I won the qualifier in northern California. I was to go against Dave Patton. He is the best of the best. I knew I intimidated him. Nerves got to Dave because he said later. I won the light weight. I was really humbled. I knew that God put me in the place and made me a champion. I knew then that this was something more than just a guy arm wrestling. I knew that it was more than that." Jerry Cadorette: "Best memory for me was when I pulled Cleve Dean in a 3 minute match for 3rd place. I competed in the last 4 meets they put in, got 5th the 1st year in 92 then 4th in 94, 3rd in 95, 2nd in 96... Guess had they done it in 97 I was going to be the new champion. This event was epic, and always the one everyone looked forward to!" Special thanks to Ray Darling, Steve Stanaway, and Ken Taylor without whose help this article could not have been written.